A single connector to connect two battery water timers or other devices to a single 3/4" tap, independently regulating water flow on each way. Tool-free installation. Ensures a stable, leak-free connection. Its ergonomic design makes it easy and convenient to use even with wet fingers. To connect 2 hoses at the same time to the tap. Includes on/off valves and washer. Easy attachment by simply screwing on. 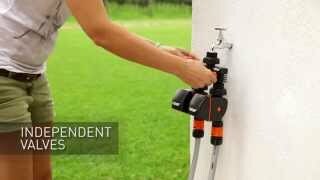 For taps with 3/4” thread; enables assembly of two water timers, pressure reducers, etc.